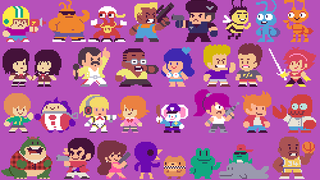 Inspired by Bubble Bobble, pixel artist Paul Robertson took Taito's 1986 classic's style and redrawn a whole bunch of video game and pop culture characters. 300 of them to be exact. Here's all of them, and I'm pretty sure this would be the best tileset ever for an RPG Maker game. Even JoJo is there! And Lupin! And Pepsiman! And... Louis C. K.?